Vietnam recorded a trade surplus of over 3.3 billion USD from January to October with foreign direct investment (FDI) companies continuing to outpace domestic firms in export revenue, according to the General Department of Vietnam Customs. Total trade turnover exceeded 284.5 billion USD during the period, including 143.9 billion USD in exports – a year-on-year increase of about 7 percent. In October alone, the country raked in more than 15.4 billion USD from overseas shipments, down 0.1 percent from the previous month, nearly 11 billion USD of which was earned from export activities of FDI enterprises, up 0.3 percent from September. Phones and components topped the list of export commodities in October with revenue of over 2.83 billion USD, down 2.6 percent month on month. They were followed by textile and garment products with more than 1.9 billion USD in turnover, dropping by 10.7 percent. 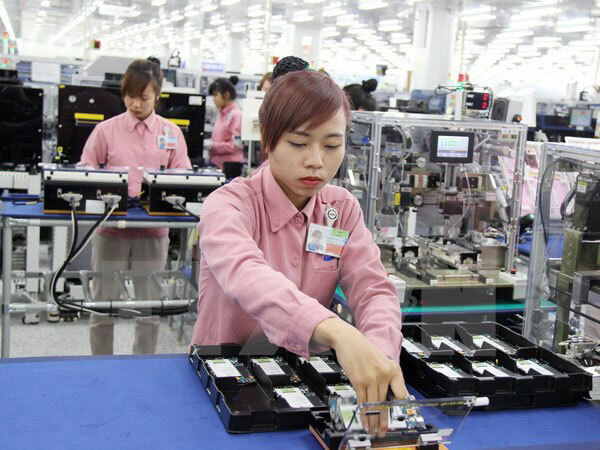 Computers, electronic products and components ranked third with a monthly export revenue increase of 10 percent, according to Vietnam Customs. The US remained the biggest market with over 3.26 billion USD spent on Vietnamese goods in October, bringing 10-month exports to the country to 31.55 billon USD. The respective figures for China, the second biggest importer, were 2.2 billion USD and 17.3 billion USD. Vietnam Customs said the country imported more than 140.65 billion USD of commodities in the first 10 months of 2016, including 15.84 billion USD in October. Imports by FDI firms reached some 9.5 billion USD in October, rising by 7.7 percent from the previous month. Computers, electronic products and components were the goods with the biggest import turnover, 2.7 billion USD, up 11 percent month on month. Machinery, equipment and spare parts were second with 2.38 billion USD, up 3.9 percent. China continued to be the biggest exporter of goods to Vietnam, which imported 4.3 billion USD of goods from this country in October, bringing 10-month imports to more than 40.2 billion USD. Imports from Japan and the US were respectively estimated at 1.38 billion USD and 932 million USD in October, reaching 12.2 billion USD and 6.85 billion USD in 10 months, according to Vietnam Customs./.